I was born and brought up in Sri Lanka. Started to learn how to cook from Grandma when I was 6 years old. Studied Multidisciplinary Design major. Now I’m a chef / floral designer / artist. I am also a British flower grower and a member of Flowers From The Farm. I have created my artisan Gold Dust curry powder inspired by my Grandma’s curry paste. It is very rewarding working as a personal chef and cookery demonstrator. I travel mostly to provide personal chef service and supper clubs around the country and abroad. 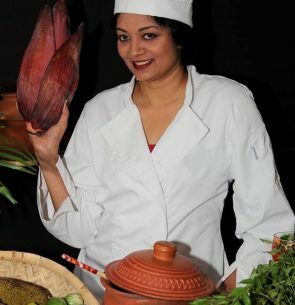 Gayani demonstrates how to create one of her trademark dishes, namely banana blossoms stir fry with Jackfruit seeds and spices.